When it comes to baked goods, pumpkin tends to show up in pumpkin pie more often than it does in any other dessert. Even people who are huge pumpkin fans – as I am – have a hard time looking at a pumpkin or at a can of pumpkin puree and not thinking about pie. But pumpkin is a great, versatile ingredient to bake with and it can go well in many other types of baked goods, adding moisture and flavor wherever it is added. 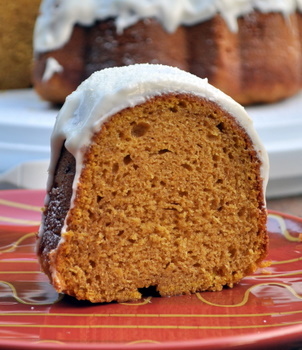 This pumpkin pound cake is a great example of showcasing pumpkin in a non-pie dessert. The pound cake has a tight crumb and the rich, almost buttery texture to it that so many other pound cakes have. 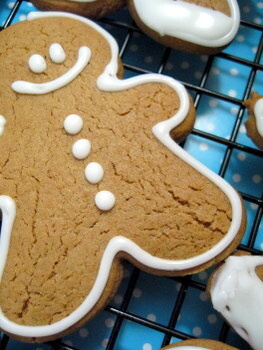 It is also very moist and very soft, thanks in part to the pumpkin puree that is incorporated into the batter. 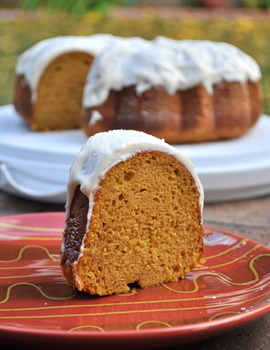 Both canned pumpkin puree and fresh pumpkin puree will work well in this recipe and will give the cake a nice, mild pumpkin flavor. I enhanced this by adding in some pumpkin pie spice (using a homemade blend) that includes ground cinnamon, ground ginger, ground cloves and freshly ground nutmeg. I added a simple cream cheese glaze to the top of this cake for a little extra flavor and to brighten up the presentation. The cake is great on its own or with a dusting of powdered sugar on top if you want to keep things simple. You can also stir in some chocolate chips, candied ginger pieces or dried cranberries to make the cake even more interesting. It keeps well for a couple of days when well-wrapped or packed inside an airtight container. Preheat oven to 350F. Lightly grease and flour a 10-inch bundt pan. In a large bowl, cream together butter and sugars until light and fluffy. Beat in eggs, one at a time, followed by the vegetable oil and vanilla extract. Whisk together buttermilk and pumpkin puree in a small bowl or measuring cup. Stir about 1/3 of the flour mixture into the butter mixture, followed by half of the pumpkin mix. Stir in another 1/3 of the flour mixture, followed by the remaining pumpkin and the remaining flour. Mix only until ingredients are just combined and no streaks of dry ingredients remain visible. Pour into prepared pan. Bake for about 45 min, or until a toothpick inserted into the center of the cake comes out clean and the top springs back when lightly touched. In a small bowl, beat all ingredients together until very smooth. Drizzle over cooled cake. Previous PostPrevious What is royal icing? I love this idea! 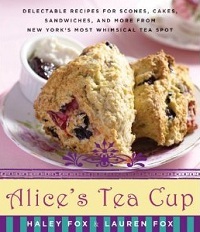 I was just getting ready to make mini pound cakes and breads for friends; I’m gonna have to add this to my list. I’m obsessed with pumpkin and this is a great idea for yet another use for it. Thanks! Dnese and totally the way I like pumpkin cake. I can’t get enough of pumpkin! I passed this on to my friend who is a huge pumpkin fan. Oh my, I bet this is delicious!! nice to find you via tastespotting. Tried this as a dessert for Christmas dinner. I added chocolate chips and made mini bundt cakes…was a big hit! What is 1/2 brown sugar? 1/2 cup?